There is immense pleasure in the company of young children. I’ve found if you listen intently – they will amaze you every time. Hailey is 7 years old, and has a rather “hefty” vocabulary for her age. Articulate and extremely polite, she is a doll-baby to talk to. Active and always on the go, she’s either competing with her swim team or playing with her sister JJ. And now that swim meets are over, she’s racing back and forth to cheerleading practice in the evenings several times a week. But on those rare occasions when she’s home and she sees DH or I outside, she loves to cross the street and visit with The Boys. I was very interested in continuing this conversation. I’m a huge “Hailey” fan, and I’m always fascinated with what she’s thinking. Plus it allowed me time to find some photo business cards from the console of my car! She told me she thought she might want to become a “writer” when she grows up. She said she likes to write and hopes to one day see her books in the Public Library so that kids her age could go and take out books for free and read as much as they wanted. I told her I was honoured she chose “my Boys” to write about, and said we would be thrilled to have her as a guest writer for the Groovy Goldendoodles™ BLOG. She giggled as only Hailey can, and then erupted into the biggest smile. A smile bright enough to melt the North Pole AND your heart. Thank you Hailey for just being you! Hailey did an excellent job on her story. I really enjoyed it and I can’t wait to read another one of her stories. Hailey is so tickled to find out that so many people like yourself enjoyed her story. She will definitely write again for us one day. Hailey is my beautiful niece! What a wonderful story you wrote about her. 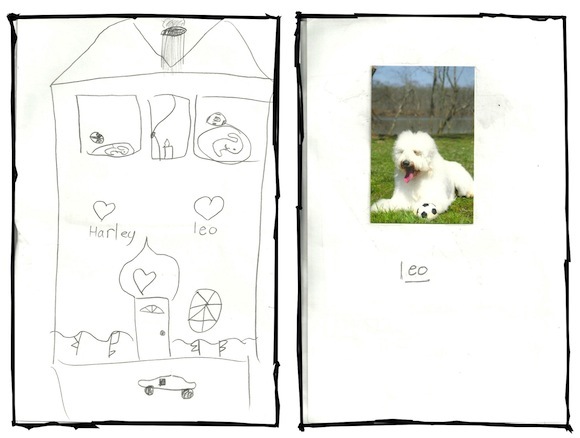 And a fantastic story Hails wrote about your doodles! Hello Dani – Hailey is my neighborhood highlight. I enjoy both her and JJ. They are incredibly sweet, so well behaved, and a treat to talk to. Happy you enjoyed her story, and hope you continue to read about the adventures of The Boys. Oh Hailey is a little doll baby! You can just see her personality beaming in her smile! What a sweetheart! Please tell Hailey that I just LOVED her story! When I was around her age I wrote my first story about 2 turtles that we had. Also tell Hailey to keep swimming! I used to be on a swim team too! Thank you for introducing us to this precious little girl and special ((((hugs)))) for YOU, recognizing what a special gem she is! 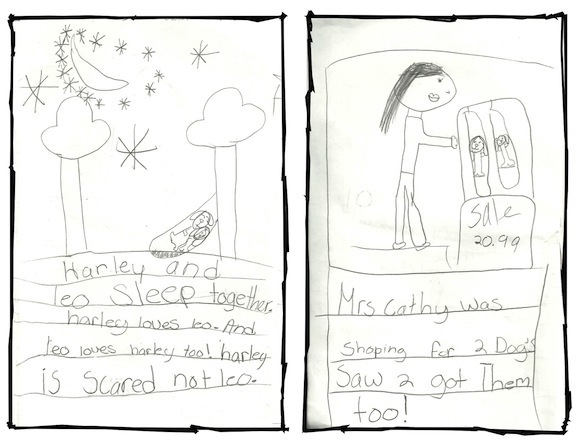 Hey Caren – I certainly will let Hailey know you loved her story! How’s Dakota doing? Are you enjoying your new website? Take care! 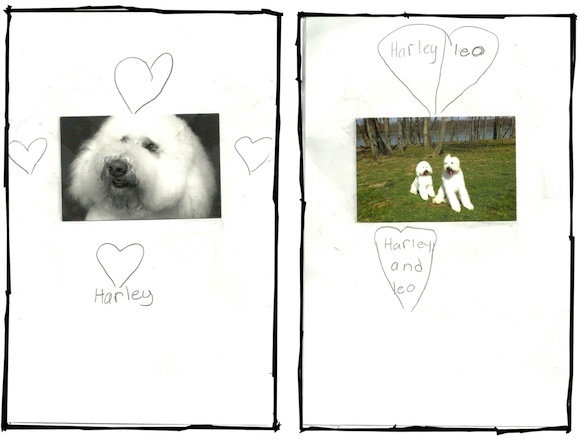 I really enjoyed Hailey’s story about Leo & Harley. She’s quite the writer and gives great details about what she observes while watching them in the neighborhood. You go Hailey!!! Thanks, she is my neighborhood highlight – for sure! Seems like Hailey has really gotten tons of new fans for The Boys! She is a gem! I will make sure I tell her about the shoes. Thanks so much for reading. Rock indeed! She is truly special. Thanks Lonnie, hugs, and rubs to Libby Lu! Wow Hailey you did an excellent job in being creative with your story.. Keep up the good work and continue to follow your dream.I’ll be looking forward to see your next edition. Coming from a career teacher, I’m sure this will make Hailey “beam” with pride. Thanks so much for reading. You are an awesome little girl and I love you with all my heart…You can be whatever you want to be and I loved your story. Hello Aunt Dar – What a nice thing for Hailey to read! Thanks so much for reading. Can’t wait for you to meet The Boys one day! Just precious and a great job by Hailey and DM Cathy! Hi to all and keep’em coming!! Nice to hear from you. 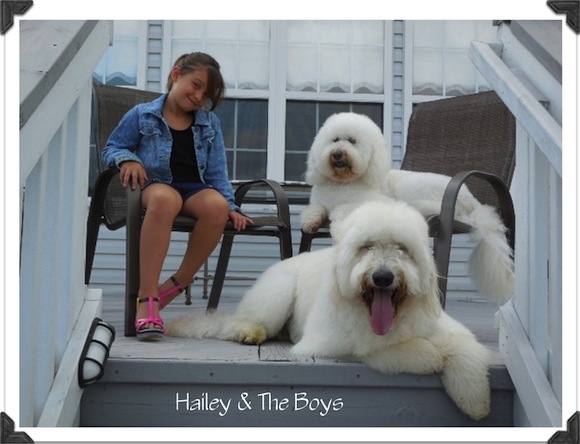 You would really enjoy meeting lil Ms. Hailey, I’m sure she would remind you of your granddaughter!Thanks so much for reading about the Boys and their adventures, and give a bark, lick and a tail wag to Atlas from them! What a sweet little girl. It is so kind of you to indulge her in her interests and dream of being a writer. She picked the two perfect subjects to start her journey. I loved her story! 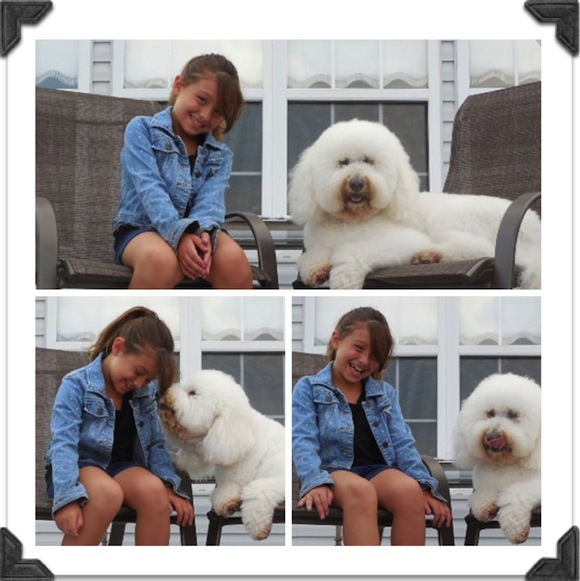 Hi Nancie – Yes, she is truly a sweetie pie! Thanks for taking the time to comment! HAve a great weekend! 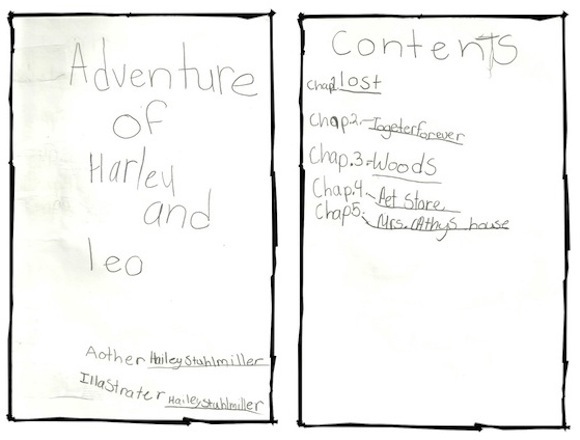 Lovely story book Hailey! I enjoyed your story and your very detailed and creative illustrations, as well. I hope you continue to write and illustrate more books in the future! Please give the doodles a hug from us! 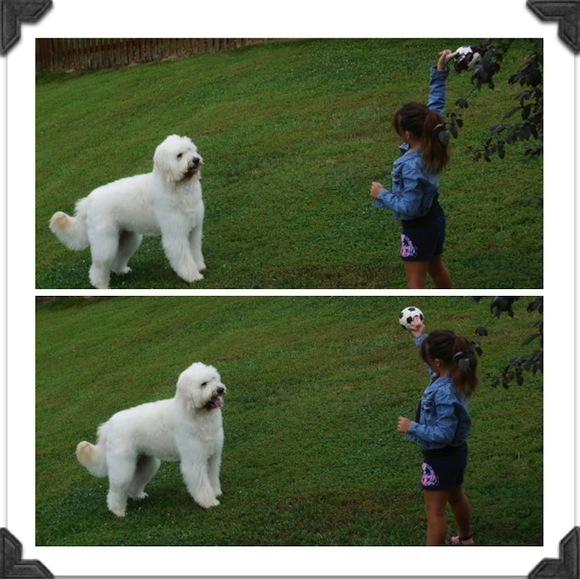 Hi Lori – Trust me, over the weekend, as long as the weather is nice, Hailey and her sister will make sure they give hugs to the boys while playing ball. Thanks for reading! 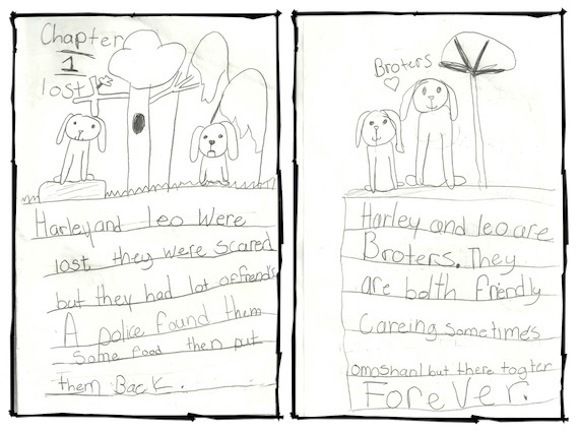 Lovely story, Hailey! I hope this book has more chapters as you continue your adventures with “the boys”–you are a great writer and illustrator! She certainly is! 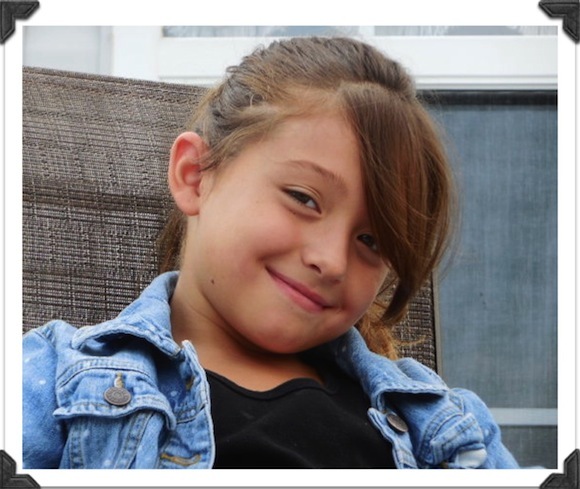 Ton’s of talent in this little angel – thanks for reading – love the comment too!